To say this year has flown by is an understatement and the fact that Christmas is less than two weeks away just boggles my mind. The past few months have been incredibly busy and pretty stressful, so much so that I couldn’t review the amazing looking November box (here), but I am back to give you an inside look at the last Mintd Box of the year. This month’s theme is Christmas (naturally) and the box contains 5 full size products and 1 deluxe sample size designed to help you “relax, pamper and spoil yourself”. In this post I am going to review all the products in the current box and then take a look back at my favourite discoveries from the previous ones, because there have been quite a few that deserve to be highlighted and talked about again. I was really excited to receive this box after missing out on last month’s edition due to my busy schedule, but to be honest, this one sadly didn’t wow me like the others have. 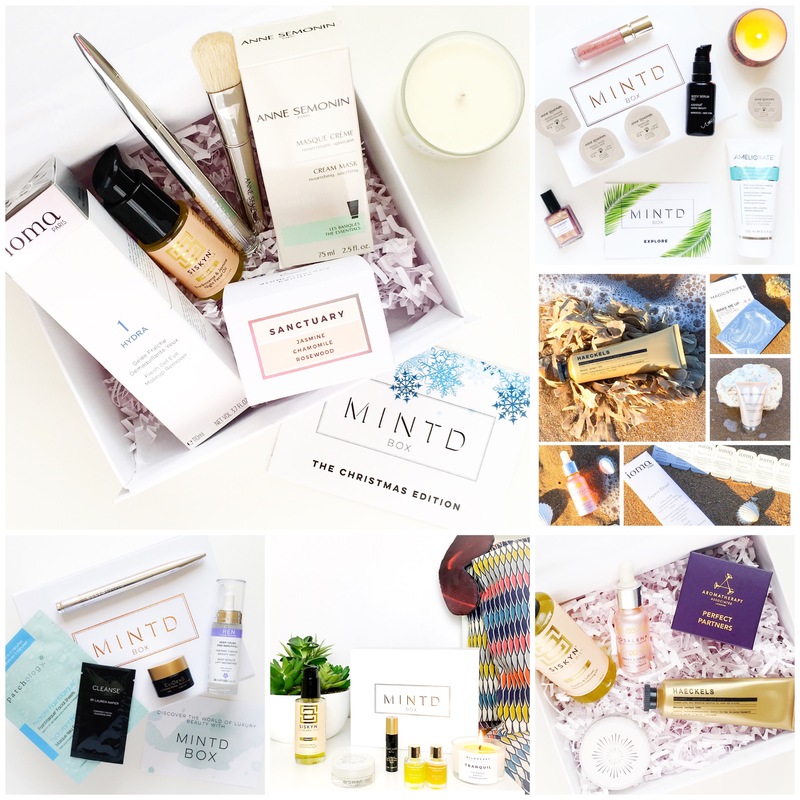 I was disappointed to see a repetition of brands, as one of the things I have come to love so much about Mintd is discovering something new, and I also would have loved to have seen a more festive product selection, considering the theme of the box. Despite this, the contents are still a fantastic value for money being worth a massive £175 but only costing £65, so let’s dive in! Ingredients: 100% certified organic ingredients – Carthamus Tinctorius (Safflower) Seed Oil, Prunus Armeniaca (Apricot) Kernel Oil, Helianthus Annuus (Sunflower) Seed Oil, Linum Usitatissimum (Flax) Seed Oil, Oenothera Biennis (Evening Primrose) Oil, Borago Officinalis (Borage) Seed Oil, Rosa Canina (Rosehip) Fruit Oil, Triticum Vulgare (Wheatgerm) Oil, Adansonia Digitata (Baobab) Seed Oil, Camellia Sinensis (Camellia) Leaf Oil, Calendula Officinalis (Calendula) Flower Oil, Santalum Album (Sandalwood), Jasminum Officinale (Jasmine) Flower extract, Helichrysum Angustifolium (Helichrysum) Oil, Boswellia Carterii (Frankincense) Oil, Citrus Medica Limonum (Lemon) Peel Oil, Pogostemon Cablin (Patchouli) Oil, Benzyl Alcohol*, Eugenol*, Geraniol*, Farnesol*, Linalool*, Benzyl Benzoate*, Benzyl Cinnamate*, Limonene*, Citral* * Naturally occurring in essential oils. The one product I was most excited to see in the box is this Night Face Oil from Siskyn. I really liked the Cleansing Oil that came in the October Box and think they are a fantastic little brand. The oil is lovely and will repair, plump and nourish winter worn skin leaving it soft, balanced and glowing. It’s also great for acne prone skin due to the high linoleic acid content, but sadly, not suitable for those who are pregnant, so please be careful if you are or think you might be. Just like the cleansing oil, this has a beautiful delicate, all-natural herbaceous scent that I really love and the texture is substantial without feeling heavy. I only need less than a full pump to sufficiently cover my face, and it absorbs nicely and layers really well with my serums. This is a great product, but it’s the second Frankincense based oil Mintd have featured (the other was in the September Box) and even though the box is well worth the price for this product alone, it’s on hold until I finish the other oil (here). 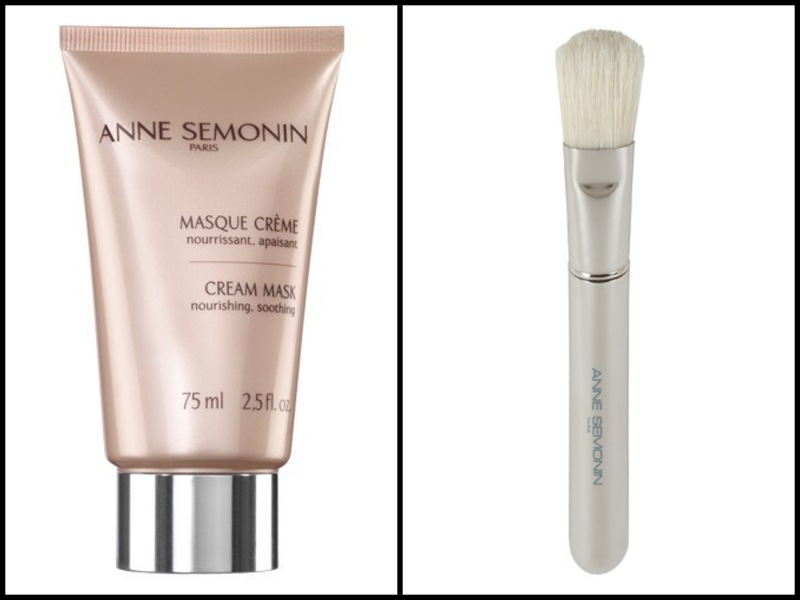 Even though Mintd have introduced me to some amazing brands since the very first box back in July, not all of them have worked for me and Anne Semonin is one of them. I was disappointed to see two more products from them being featured again, because their products just haven’t performed well for me. This marks the third time the brand has been included in a box (there have only been 6 so far) with a total of 4 different products (here and here) and really, that’s just too often for any brand. Regardless, I was actually happy to give this product a go as my skin has been quite dry lately, but this didn’t function nearly as well as my other hydrating masks. It’s definitely much better than the Exfoliating Mask from the September Box, but not enough for me to want to use it again, especially considering how rough the brush is. I would not recommend that at all because it’s stiff, scratchy and I think using it actually counteracted the effects of the mask because of how irritating it was. These two were sadly a fail for me. 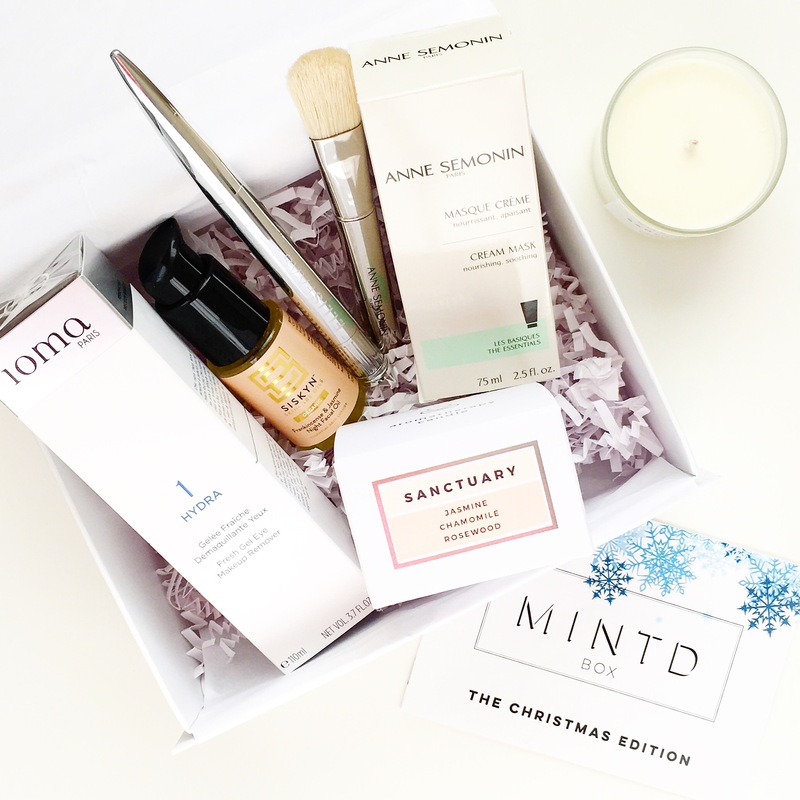 IOMA is a high-tech French brand that focuses on personalized, effective skincare products and I was first introduced to the brand in the September Box, which featured a sample kit that included this product. I was on the fence about seeing this in the box because it’s a decent product and I did like the sample I tried, but at the same time, I don’t wear enough eye makeup to warrant a separate product to remove it, and it also seems like an unnecessary added step considering most cleansers are safe to use around the eyes and very effective at removing eye makeup. Nonetheless, I am going to give this a go because it’s really light, cooling and soothing, and the formula is designed to increase lash length, strength and volume, so I want to test that. If I see a noticeable difference then that will definitely make this product worth using and worth the price tag, so I’ll keep you posted. Makeup products in beauty boxes is something I tend to dread because I usually find that the colours don’t work for me and that’s exactly what’s happened again with Ellis Faas. I really, really like the look of the brand, but this reddish-brown colour is slightly too harsh for me. The very first Mintd box (here) included a bright fuchsia colour that while seasonally appropriate, was way too out there for me. This is actually probably the most somewhat festive product in the box as winter is a great time for rocking a dark, bold lip, but I wish it was a colour more universally flattering or more Christmassy like a true red. This is going to be passed on to someone who can pull it off, but I have high hopes that one day I’ll find an Ellis Faas colour for me! I had mixed feelings when I saw this candle in the box because I loved (and quickly used up) the Tranquil one that came in the October Box and was excited to try more from Wildheart Organics, but at the same time I was disappointed that it wasn’t one of their Christmas candles. Their holiday scents, Peace (mandarin, clove and cinnamon) and Winter (white pine, mint and cedarwood) sound and look so gorgeous, and at only £7 more than this candle, would have been perfect for the theme of the box. Another more festive option would have been the stunning Gold Frankincense & Myrrh Dual Candles from Willow Organics that only cost £19 and smell absolutely divine. 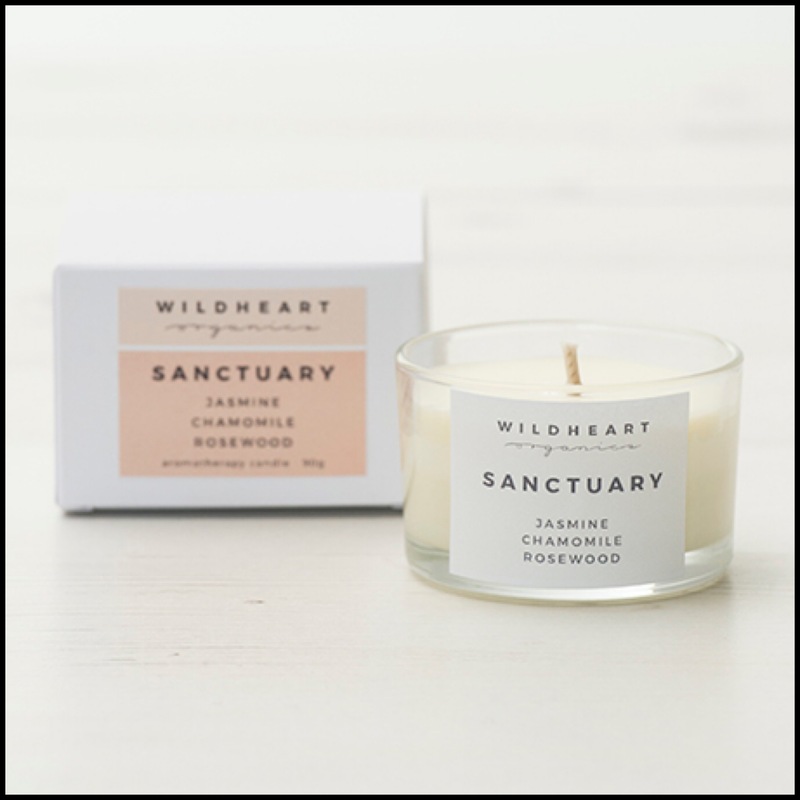 The Sanctuary candle is no doubt lovely, but the scent is so light, fresh and floral that it doesn’t match the season, so even though I love it, it’s going to be put away until spring. I know with these type of boxes it is so hard to please everyone and unlike past editions, which I have really loved, this one just didn’t do it for me. The mix of products didn’t fully reflect the theme or come together as well as they did in other boxes and I would have loved to have seen some new brands included instead of all repetitions. Overall, I still love what Mintd are doing and have discovered some wonderful brands and products thanks to them. Having only released 6 boxes, they are still a very new company and I truly believe they will continue to grow and get better in 2017 because they have already done so well this year. 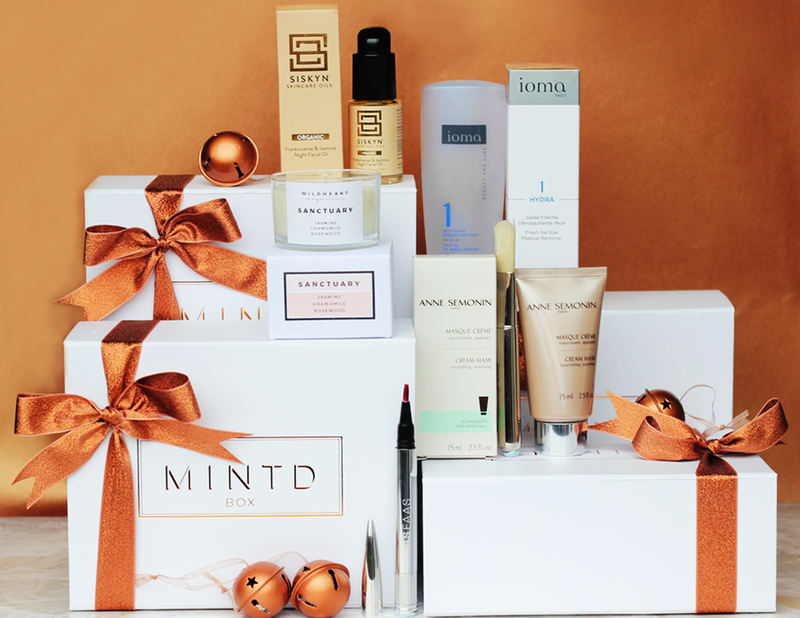 Since this box didn’t quite suit my tastes, I thought I would highlight the amazing products I have found and fallen for thanks to Mintd. Above is my “Mintd Top 5” of the year featuring my favourite discoveries and up first is OSKIA’s Bedtime Beauty Boost that was included in my personal favourite box from October (here). I usually hate moisturizers but I absolutely love this and would never have tried it if it wasn’t for Mintd. Next is the Frank & Sense Face Oil from Rosalena, a brand I had never heard of before, but one I am so happy to know about now. This is the Frankincense face oil I am currently using and I absolutely adore it. I’m so glad this came in the September Box and I love what it does for my skin. Also in that box was the beautiful Seaweed/Geranium Hand Balm from seaside based Haeckels, which is in heavy rotation right now. The scent is so unique and it hydrates my hands perfectly without feeling greasy. I love everything about this brand and it’s this type of discovery that really made me fall in love with Mintd. Likewise with this cleanser from the lovely niche brand Siskyn. I had never heard of them before but I have been so impressed by both products I have used and love what they’re doing. Lastly, this Aromatherapy Associates duo from the ‘Your Essential Beauty Sleep’ Box (which is a great example of a theme being perfectly curated) are fantastic bath oils and were a total delight in a box that just couldn’t have been better. A bonus favourite has to be Kahina’s gorgeous Fez Body Serum that I used up in record time and sadly couldn’t include in the photo because it was thrown away weeks ago, but I am obsessed with that stuff and can’t wait to get more. It was a beautiful product and again, a highlight inclusion that made me really happy when I received the box. As you can see, there have been more hits than misses with Mintd and I appreciate all the hard work the incredible and lovely founder Cheryl has put into creating these boxes. A lot goes on behind the scenes to get the right products that will suit the majority of people from the right brands and at the right prices, and it’s not easy. Mintd can only grow and improve with our support and they will always have mine. I know many of you have been hesitant about joining because of the price and/or brands included, but the subscription is truly well worth it because you always save over 50% and in this box it’s a lot more than that. Mintd have made a great start and I am so excited to see what next year brings! If you’d like to get your hands on this month’s box you can subscribe here and get 10% off your first box with the code 10OFF1ST. I couldn’t express better my feeling regarding this December edition. Hi Arly! Mar reminded me about your review of the Siskyn night oil because I have not used mine yet. I’m going to get in touch with them to give them the batch number to make sure it is still good to use. 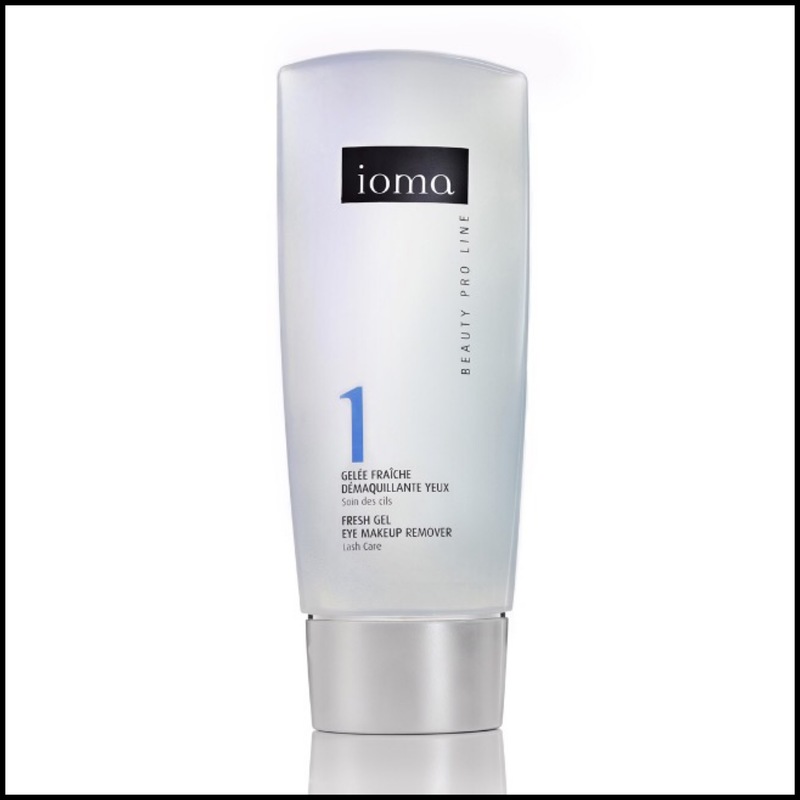 Did you end up using the Ioma makeup remover? I had a really difficult time with that one because my skin just soaked it up. My eyes soak up everything, ha ha. I’m used to it. I have an Armani makeup remover that’s also a cleanser. It’s gel-based and I can’t use it that way. I have to add water. I checked with the company and the oil is still good. Yay!